Those crazy geeks at iFixit are at it again, this time tearing apart the new iPad Mini. While the new 7" iPad mini isn’t even officially on sale yet, those geeks over at iFixit managed to work their magic and get their hands on one to tear apart. For DIY'ers there are some good signs and some bad signs. For starters iFxit says that like many of Apple’s other gadgets, the iPad Mini isn’t very easy to open up and repair yourself. The good side is that unlike some of the previous iPhones the LCD and front glass are separate components, making replacement of individual components a possibility (and making a repair less expensive). Second, the battery is not soldered to the logic board, though both it and logic board are held together with "copious amounts of adhesive". 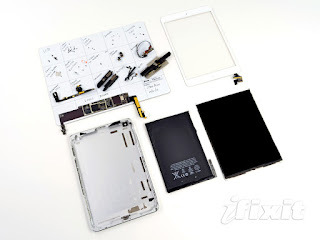 Overall iFixit gives the iPad Mini a 2 out of 10 repairability rating noting that the tons of adhesive and the lightning connector being soldered to the logic board make at-home repair less than ideal. In terms of internals there weren't many surprises. The Mini has a 7.9" 1024 x 768 pixel (163 ppi) Samsung multi-touch display, stereo speakers, a 1.2-megapixel front-facing shooter, and a 5-megapixel rear camera that can shoot HD video. 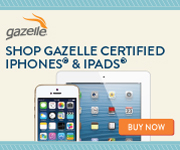 The hardware comes cutiousy of a few different manufactures. There is an Apple designed Dual-core A5 processor with 512 MB of RAM, Hynix NAND flash for storage and a number of microchips from Fairchild Semiconductor International Inc and Broadcom.